Christmas is perhaps the most evocative time of year and one that fills us with warmth and joy. Music and sound go hand-in-hand with festivities, celebration and relaxation and similarly, provoke feelings of sensory pleasure. It’s well known that music can help people feel better and alleviate feelings of anxiety, depression or stress and the British Association for Music Therapy advocates the use music to help those with mental health problems*. Since Christmas ‘tis the season to be jolly’, high street retailer Robert Dyas have compiled a list of their twelve favourite audio gadgets to keep young and old entertained throughout the yuletide period. Whether you are hosting multiple parties, wondering how to entertain at family get-togethers or hoping to savour some peace and tranquillity, there’s something to suit you. Christmas season is party season but what’s a party without music? Whether hosting an elegant seasonal soiree or a night of pure and utter revelry, having the right musical accompaniment is crucial to set the perfect mood. 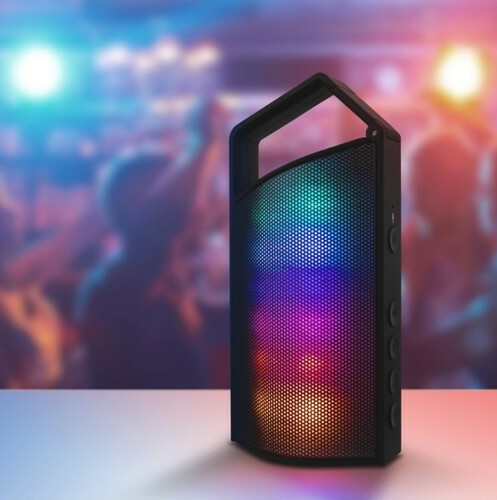 If you’re looking for a speaker that pulls out all the stops, look no further than the Intempo EE2383 Portable Party Speaker with LED Lights (£99.99 reduced to £69.99). With two impressively large speakers, LED lights and the ability to be used both indoors and out, you’ll guarantee that guests can dance the night away to their favourite tunes no matter what is added to the playlist. Prefer vintage to contemporary? Opt for a real retro feel this Christmas with the Itek Small Bluetooth Jukebox with CD Player and Radio (£89.99 reduced to £49.99). Whether you want to listen to a CD, FM radio or stream music via an AUX cable or Bluetooth, this jukebox has you covered. Plus, it will add as a fabulous feature to a bedroom or sitting room. Driving home for Christmas? This AKAI Dynamix2 Bluetooth 3w Speaker - Grey (£19.99 reduced to £9.99) is ideal for a speaker on the go. Portable and lightweight and able to be connected to any bluetooth device, it can be packed for trips easily without compromising on sound quality when entertaining on the go. Given its compact size, it also makes an ideal stocking filler for any music lover! For many, Christmas time is best spent at home and having your favourite sounds playing gently in the background sets the perfect backdrop to whatever you have planned. Prepping the vegetables and basting the turkey? To really get you in the festive mood, add some carols to your chores. The AKAI Retro DAB Radio – Cream (£49.99 online only) will not only look beautiful on a counter top but also boasts both FM and DAB radio stations to keep you company whilst carving. It’s your kitchen’s new best friend. 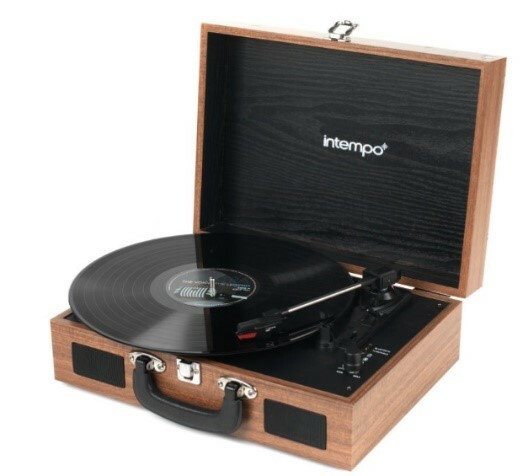 If you’re vehement about vinyl then the Intempo Rechargeable Bluetooth Wooden-Effect Turntable – Tan (£39.99 online only) is the sound system for you. With the ingenuity of an in-built Bluetooth connection, you can also play music through your smartphone or tablet meaning you’re spoilt for choice and the whole family can enjoy using it. Who says you can’t have everything? Charades, board games and a good old sing song. What better way to keep the family entertained at Christmas time than with some wholesome entertainment? Nothing gets people up on their feet like the chance to be a popstar and you can create the wow factor at home with one of these X-Factor Microphone Speaker (£24.99). Put on a show and let your talent do the talking. Pair with this Intempo Black Wireless Bluetooth Tailgate Speaker (£59.99 reduced to £29.99) and you’ll be the centre of attention in every single performance. For those who prefer to keep their singing more secluded, why not indulge your inner-crooner with this adorable Intempo Shower Speaker (£9.99 reduced to £4.99) available in black, blue or pink. Connect a phone or MP3 player and sing away to your heart’s content whilst lathering up with the suds. This could be the perfect stocking filler for the person who loves the sound of their own voice. Christmas can be chaotic, especially when you have family and friends staying. For moments where you need some ‘me time’ or a break from the pandemonium, plug in to the AKAI Dynamix2 Bluetooth Earphones - Black (£19.99 reduced to £9.99). No messy wires to contend with either, so they are perfect for relaxing at home or when you’re on the go. Keep the little ones entertained without compromising on your comfort with a playful pair of headphones. The Groov-e Earmoji DJ Style Kids Headphones - Heart Eyes Face (£15.99 reduced to £9.99 online only) are adjustable to provide extra comfort and will keep children entertained on long car journeys that often occur when visiting relatives. It’s the perfect way to listen to their favourite music or watch their favourite festive film – without distracting the driver. This press release was distributed by ResponseSource Press Release Wire on behalf of Robert Dyas in the following categories: Children & Teenagers, Men's Interest, Entertainment & Arts, Leisure & Hobbies, Home & Garden, Women's Interest & Beauty, Consumer Technology, Business & Finance, Media & Marketing, Retail & Fashion, Computing & Telecoms, for more information visit https://pressreleasewire.responsesource.com/about.